Winterizing A Boat: Your Personal Guide! 'Winterizing a boat' isn't difficult, but it takes some time and effort. It's the process where you make your boat ready for an extended period of non-use. You put her literally in sleep-mode. 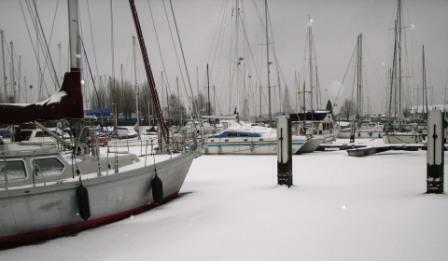 How to winterize a boat? You need to do a few things, depending on the gear on board and where the boat will stay. First of all, a good clean-up is a good start, inside and outside, of course! Second, some machinery will ask for a certain treatment. Third, make a list of things you need to repair or replace. Go straight to the Winterizing Checklist! If at all possible, I would recommend to overwinter in a mild climate where you don't have freezing temperatures. If that's not possible, you need to take precautions concerning all the waterpipes on board. Water expands when it freezes, so, if you don't put anti-freeze in your pipes, the frozen water will damage the whole system! In my opinion, if you plan not to use your yacht in the next 3 to 4 months, I recommend you do it. If you don't use your boat in the off-season, but you can turn on all the machinery and so on, you can do less or no winterizing at all. What's the benefit of winterizing a boat? Your yacht will love you until eternity! No, honestly, a boat looked after will look after you! Next summer, when you're overflowing with new cruising destinations, you arrive on a clean yacht in good working order. You're ready to go. This is a no-brainer to me, so let's do it! Go to the Winterizing Checklist.